Did you know that October is National Pasta Month? I didn’t! You’d think I would know that, being a huge pasta fan myself. I pretty much lived off spaghetti and marinara sauce in college (one box would last me three day for just $1) and even though my family is half German and half Polish, you’d think we were full blood Italian by how much pasta we eat. My mom’s recipe book is jam-packed with pasta recipes of all types– lasagna, ziti, ravioli, pilafs, salads, bakes, stir-fries… it’s endless! To celebrate National Pasta Month, The Recipe Redux is hosting a contest sponsored by the National Pasta Association called “Pasta Fits”. One of my favorite pasta dishes my mom cooks is an orzo, shrimp and feta cheese dish. It’s creamy, savory, and I could pretty much eat the whole pan. I decided to take a few components of my mom’s recipe and switch it up a little to create my first entry for this contest. Be on the lookout this week for TWO more recipes as I celebrate National Pasta Month! So how can pasta fit into your lifestyle? Well for starters, it’s very affordable. Most dried pasta sells for about $1 a pound and you can make 6-8 servings out of one box. Like I said, I used to live off spaghetti in college for super cheap. Two, it’s quick. Most pasta boils in under ten minutes, ideal for creating quick dinners for families on the go. And finally, when combined with lean proteins and fresh vegetables, it can boost energy, satisfy your hunger, and create delicious meals. Pasta is a no-brainer at my house. I’ll make some version at least once a week. We always keep a box of pasta and a jar of marinara sauce in the pantry for “food emergencies”. I mean, what is more comforting than a bowl of rotini and a big dollop of marinara? Mayyyybe this recipe that I’m about to share with you? 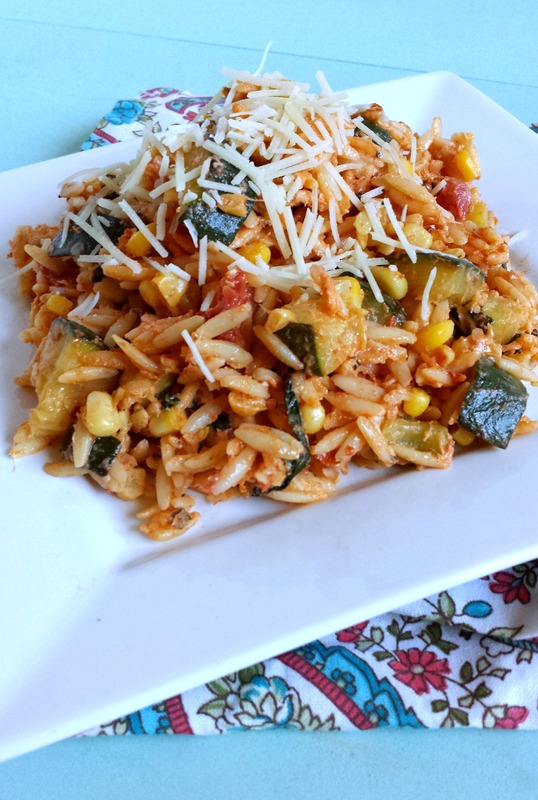 I wanted to combine the spicy flavors of red pepper, the savory taste of tomatoes, and creamy goat cheese with corn, zucchini and orzo. The result was terrific. I am a huge, huge fan of goat cheese and love what it can do to a dish. It’s so creamy, slightly salty and has it’s own unique flavor. In this dish, using goat cheese totally transformed the orzo from a regular pasta dish to a rich, creamy, savory dish. Sprinkled with a little Parmesan-reggiano and YUM! I could eat the entire pot. Boil the orzo according to package directions. Drain and set aside. In a large non-stick pan, warm 3 Tbsp olive oil over medium-high heat and add the corn. Season with salt and pepper and cook until corn is golden, about 8 minutes. Transfer to a large bowl and set aside. Return the pan to medium-high heat and add the remaining 3 Tbsp olive oil. Add the diced zucchini, cooking until it is tender and golden, about 8 minutes. Transfer to the large bowl with the corn. Set the pan over medium-low heat. Add the two cans of diced tomatoes, 1/2 tsp salt, black pepper to taste, garlic, oregano and red pepper flakes. Let simmer for about 5 minutes. Stir in the tomato paste and cook for 1 minute. Add the wine and let simmer for about 3 minutes until reduced. In a large bowl, combine the orzo, zucchini, corn, basil, sauce, goat cheese and parmesan. Serve with an additional sprinkling of parmesan. Be sure to check out the other entries in the contest! Yeah haha, that’s what I said! Bring on the pasta! It’s pretty much Pasta Month every month in my house and I’m a shrimp + pasta lover too. I rarely pair goat cheese with my pasta but I have to start doing that more often – love all the ingredients in this one. Haha yes it’s always pasta month for me too! 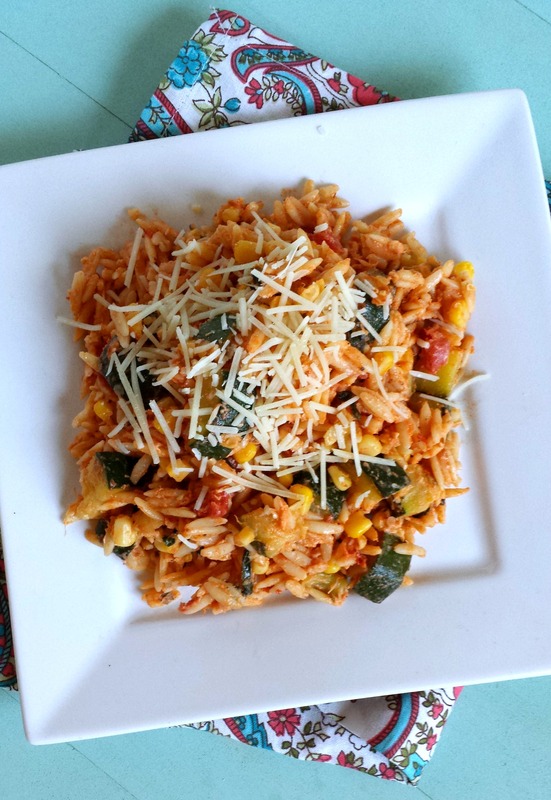 Love that you used orzo – don’t think a lot of people realize it’s a pasta! This looks like my kind of dish..mmm. 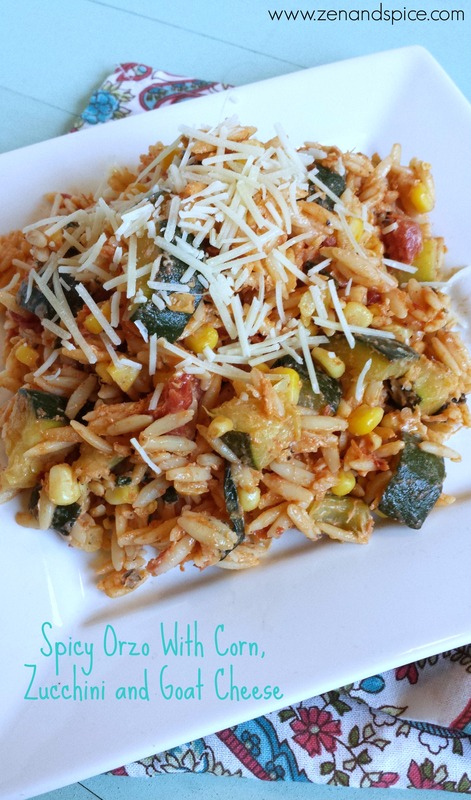 I love orzo– it has such a great texture!